Wireless interface for Custom Autosound CD controller radios (USA-630, Secretaudio and Slidebar Radios). 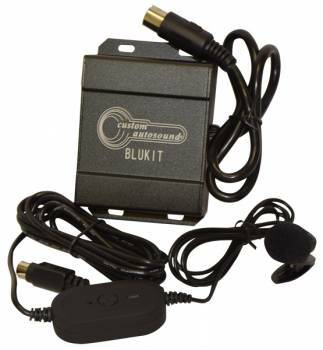 This adapter plugs into the CD changer port of your Custom Autosound radio and gives you the ability to do hands free calling from your bluetooth capable phone. Also listen to music stored on your A2DP enabled bluetooth device. If you have a CD changer or CD1 single player you can still use it with the adapter plugged in (there is a CD changer port on the control box of the Bluekit). ?Main control box has a 1.5' cord that goes to radio CD port, 6.5' cord to answer button and 3.5' cord from answer button to microphone.